Once the days get colder and fall arrives, the weather can get fairly uncomfortable. Most of the people enjoy activities outside on a sunny day but would never think about doing a sport like tennis during rain. Anglers are different. When clouds cover the sky and it rains constantly there is a good chance for some awesome hours on the river, as long as you wear good rain gear for fishing. An overcast day with some light rain can certainly be beneficial for your fishing success. As soon as the sun disappears and the temperatures cold down, trout and bass do not see the need to hide in deep waters anymore. They move closer to the surface, where the chance of catching food in form of flies is notably higher. Many seasoned fisherman will tell you, that the best time to catch fish, is right before the drizzle starts and during the first hours of rainfall. The reason for that is that almost all freshwater species get more active during that period. A decent amount of rain has the chance to flood insects into rivers or lake providing a great food source for the fish you are most likely trying to catch. Fish starts to look out for possible prey actively, letting your fly or lure look enticing. It would be more than annoying to miss out on all that bites, just because you have to run back to your car to avoid getting wet and there is no need to suffer from soaked up clothing. To prevent that from happening, it is wise to be prepared for those situations, by packing the best rain gear for fishing. No matter if you sit inside a boat, next to a lake or even stand in a river. You should be set up as soon as the rain starts pouring down. Even when you prefer fishing being on dry ground, in form of a boat or in a comfortable chair, there is a good reason to wear waterproof boots. Rainy weather will soften up ground that was completely dry before in no time, creating mud and puddles all over the place. If you do wear a pair of waterproof boots, your socks won’t get wet and you will have way more fun out there. Therefore they should definitely be included if you are looking for the best rain gear for fishing. A good material to look for is GORE-TEX. It has proven to be one of the best fabrics for that purpose and is currently used widely in the industry. If you already own a pair of decent hiking boots they are probably also a good fit and even rubber boots will do the trick, but won’t be as comfortable. If you do own boots already, but they lack the waterproof feature, there are really affordable waterproofing sprays, that will coat said boots with an invisible water repelling substance. This obviously does not count for people that are already wearing wading equipment, since they are prepared to face waist deep water and probably use wading boots. Another item that should also be included in the best rain gear for fishing is waterproof pants. There is a huge selection available mostly targeted towards hikers. Again GORE-TEX is a really popular material and broadly used. It is breathable while being waterproof or at least water repellent and a good choice. This type of equipment can be fairly pricey though and is only worth purchasing if you plan on fishing during rain on a regular basis. If you do not want to spend hundred dollars or more on high-tech outdoor pants, a cheap pair of rain pants is a perfect alternative. You will be able to wear a comfortable pair of trousers and as soon as it starts to rain, you can quickly put on your rain pants as an additional layer. They will protect you from getting wet and even insulate slightly. As already mentioned, they are relatively cheap. You should get a decent pair at your local outdoor store for under 30 dollars and the moment that rainstorm hits, they will be well worth it. Again, fly fishers can obviously skip this part. 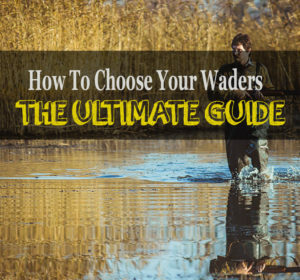 If your waders protect you from the million liters of water that pass you while standing in the river, they should hold up against some rain. If you are looking for the best rain gear for fishing, a rain jacket is probably the most important item. No matter if you sit in a boat or stand in the river, your upper body will be most exposed to the rain. When it comes to waterproof jackets you have two main options. Number one is a classic PVC rain coat. They are cheap, used since decades and hold up perfectly against rain since they are completely waterproof. 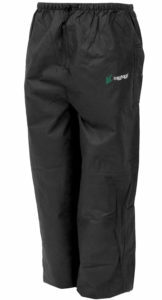 Similar to rain pants they are a classic choice and suitable for spin casters and fishing from boats or shore. The second option is a more expensive rain jacket made from breathable waterproof materials. If you are fly fishing you will move a lot more through constant casting action and wearing a PVC raincoat will make you sweat faster than desirable. There is no point in being perfectly protected against water from the outside when a decent amount of moisture comes from the inside. Breathable materials create a permeable membrane letting moisture escape while at the same time preventing water from entering your jacket, same concept as in breathable waders. 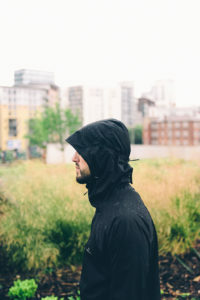 If you are going to buy a new jacket, keep in mind that a few extra pockets can be really handy while wading and it should definitely come with a hood. A lot of manufacturers offer combinations of jackets and trousers. They are completely waterproof, lightweight, cheaper compared to buying them separately and therefore a good option if you are looking for the best fishing rain gear for the money. Available in all price ranges you can get those suits made from cheap PVC or even high tech GORE-TEX materials. Made to synergize well they provide perfect rain protection and there are a few manufacturers that produce fishing rain suits solely designed for that purpose. In my experience, spending a bit more money here can definitely be worth it since full body suits insulate well and might let you sweat when it gets slightly warmer. Therefore breathable material is worth getting and usually also more durable than PVC. Only necessary for colder days, gloves are certainly nice to have. Wet hands tend to get cold faster and numb fingers can be a problem when you have to hold the rod while cold winds are blowing. There is a wide selection to choose from with a surprisingly amount of different features. 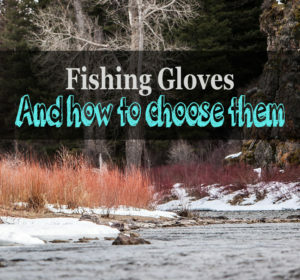 If you want to read more about this topic, you can check out my buyers guide for fishing gloves. When weather conditions in your area are more uncomfortable and you have to deal with constant and cold rain on an everyday basis, you might want to take a look at commercial fishing rain gear. These products are designed to withstand unforgiving conditions and worn by people catching salmon in sometimes heavy storms out on the open ocean. While not being suitable for fly fishing and usually an overkill for casual shore fishing they are perfect for boats and general saltwater fishing. I had the chance to wear said equipment a few times while fishing on the west coast and there is nothing that can compete with this type of gear when it pours all day. I actually started to really enjoy the rain since those suits provide full protection and keep you warm and dry. They also come with an inbuilt life vest most of the time. You can choose between full body suits or separate trousers and jackets. The downside is that they can be pretty expensive. A quality commercial suit can cost up to 600 dollars. A good tip is to check eBay or craigslist for used items which definitely saves a lot of money compared to buying a new one. They are also very durable and last forever, so even used ones will serve you well. Keep in mind that they are not really lightweight and packing them small can be kind of a struggle when you want to take them with you for a trip. In general, the best rain gear for fishing does not have to be some sort of high-end product and as you can see, even cheaper products will do the trick most of the time. If you own rain gear for other outdoor activities, such as hunting or hiking, these products should also serve you well while fishing. Since you do not want to miss out on what is probably the best time for bites, proper rain gear for fishing is something you should always have available as soon as the weather starts to gets unpleasant.